That’s a $1 billion increase beyond the already projected $7 billion. Dominion’s original cost estimate for the ACP was $4.5-5 billion, and the original in-service date was late 2018. Cost estimates are now $8 billion, with an in-service date for the proposed project of mid-2021. This entry was posted in Certificates of Approval, Court cases, Dominion, Tree cutting on January 17, 2019 by Ellen Bouton. Dominion rushed to get the permits and rushed to cut the trees, and despite the various restrictions on what, where, and how cutting could occur, the Virginia Department of Environmental Quality issued 15 separate violation notices of tree felling within wetland buffer zones and stream crossings that were supposed to be protected. This entry was posted in Dominion, Tree cutting on January 9, 2019 by Ellen Bouton. 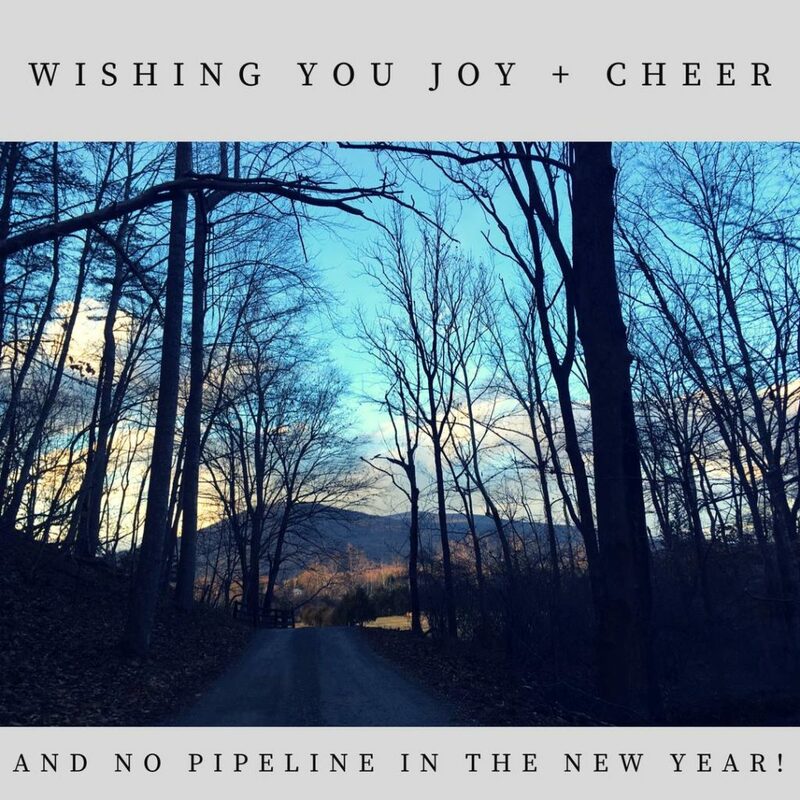 2018 was an eventful year in our ongoing fight against the Atlantic Coast Pipeline – it’s been four and a half years now, and Friends of Nelson and our allies remain strong and determined. We are honored by your continued support. Whether you sent in a check, showed up for a public meeting, submitted comments at a hearing, held signs in protest, wrote a letter to the editor, provided a comment on a news article, expressed thoughts in social media, walked the ‘line’ with us, or participated in any of the myriad ways to spread the message of our resolve – you have our heartfelt appreciation. Together we have already achieved a great deal. We have publicized eminent domain abuse and the loss of individual property rights, researched and reported on the potential economic impact to our county, documented the dangers of building the pipeline on steep slopes, emphasized the value of our water and natural resources, helped bring attention to social injustice, and expressed our concern about climate change to those charged with acting in the public interest. We have changed the conversation. The issues raised in response to Dominion’s proposed ACP have become front and center in Virginia; no longer can a candidate or elected official use the easy ‘it’s out of my hands’ excuse to avoid taking a position on fossil fuel infrastructure and eminent domain abuse. Legislation has been introduced to address many of the egregious regulatory statutes written by big energy, for big energy, but paid for by the rest of us. We have held the line. Through our many and various efforts to hold permitting agencies accountable, the project’s initial ‘in service’ date of Winter 2018 has been extended once again. Dominion’s most recent revised estimate? Summer 2020. Our prediction? No pipeline – period. But there is much more to do. Friends of Nelson will continue this fight in the courts and on the ground. We hope for your continued support through a monetary donation and through participation in one of our 2019 campaigns. Please start out the New Year by joining us for our annual celebration on January 5, 2019, 6-10 pm (doors open at 5:30) at Rockfish Valley Community Center. Bring a labeled dish to share at our potluck, and bring your dancing shoes – we’ll have live Music by The Findells. January 18, 2018: ABRA Members Sue Virginia Over ACP Approvals. A coalition of environmental and conservation organizations filed a legal challenge to the Virginia State Water Control Board’s December 12 approval of a water quality certification for the ACP. The suit, filed with the Fourth Circuit Federal Court of Appeals by the Southern Environmental Law Center (SELC) and Appalachian Mountain Advocates on behalf of the client group, charges that the Board’s decision failed to consider the impacts of the project on water quality in Virginia sufficiently to meet the requirements of the Clean Water Act. January 19, 2018: FERC issued an approval for the ACP to proceed with tree felling for its pipeline project. January 22, 2018: ABRA announces Pipeline Compliance Surveillance Initiative (CSI). Since then, Friends of Nelson has partnered with ABRA and other regional organizations in development of a citizen monitoring effort for construction activities related to the ACP. Several orientation and training meetings were well attended in 2018, and more intensive trainings are planned for the coming months. Volunteers can work in the field gathering needed documentation of construction impacts, or can be trained to review submitted documentation for analysis prior to submission to the appropriate governmental agency. February 5, 2018: the Nelson County Board of Zoning Appeals dismissed seven of Dominion’s eleven requests for variance to Nelson’s floodplain ordinance for lack of standing, and granted deferrals for a hearing on the remaining four. “Lack of standing” means that Dominion requested variances on properties it does not own or for which it has no legal right or easements; Virginia law does not permit such requests. February 5, 2018: Southern Environmental Law Center and The Sierra Club on behalf of a coalition of conservation groups filed suit in federal court against the National Forest Service over a grant recently issued to the ACP. March 1, 2018: Judge Moon, of the US Western District of Virginia Federal Court in Lynchburg, granted ‘immediate access’ for tree-felling on 16 of the 27 Virginia properties for which Dominion requested access. Notice issues, meaning parties were not served the lawsuits or did not have adequate time to respond, prevented Moon from ruling on the 11 remaining properties, but he expects “proper notice to be achieved” in the next two weeks. 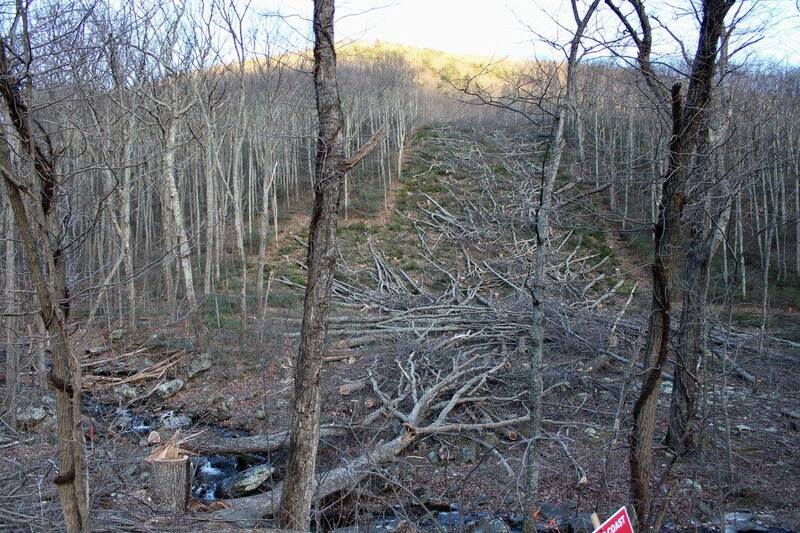 March 6-7, 2018: Dominion clear-cuts on Beech Grove Road at the entrance to Wintergreen at the site of the proposed horizontal directional drilling under the Blue Ridge Parkway and Appalachian Trail at Reeds Gap. As of the year’s end, the clear-cut swath up the side of the mountain remains glaringly visible, covered with still-untouched felled trees. 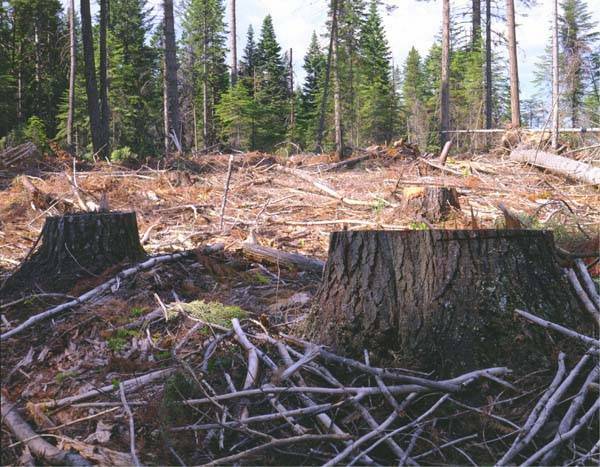 Trees were cut before Dominion received all permits, and, because of a number of stays and denied permits, ACP construction is currently on indefinite hold. March 9, 2018: The Southern Environmental Law Center and Appalachian Mountain Advocates, on behalf of their clients, filed a request asking the Fourth Circuit Court of Appeals in Richmond to halt construction of the ACP until the court decides whether the FERC’s permit is valid. March 16, 2018: ACP seeks an extension to May 15 for tree felling outside of the limitations they agreed to for bats and migratory birds. FERC issued a denial of the request on March 28. May 30, 2018: Gov. Ralph Northam’s Advisory Council on Environmental Justice reached consensus May 30 on a draft statement recommending a moratorium on new gas infrastructure in the Commonwealth and calling for a stream-by-stream assessment of the impact of both the Atlantic Coast and Mountain Valley pipelines. On August 16, the Council called for a stay on all further permits for the Atlantic Coast and Mountain Valley Pipelines. The Governor rejected the report, saying it was merely a “draft,” The Council stated that it was a final report, the Governor then ignored it. June 7, 2018: Early in the morning on June 7, 2018, a massive explosion in a new natural gas pipeline just south of Wheeling WV sent huge fireballs into the sky that could be seen miles away. The line that ruptured was a brand new, “best-in-class,” 36-inch diameter pipe with operating pressure of 1,440 PSI, just put in service in January 2018. The explosion was triggered by a landslide which caused the “best-in-class” pipeline to rupture. The mountainous terrain where the ACP proposes to build its “best-in-class” pipeline is particularly susceptible to landslides, especially when fill material generated by construction is deposited on slopes after the pipelines are buried. June 28, 2018: Little Pink House showing, to help educate the public about the importance of fighting eminent domain abuse. July 19, 2018: The Nelson County Service Authority Board voted unanimously against a proposal to set a rate of more than 10 cents per gallon and a connection fee of $500,000 for the ACP, which wanted to purchase 40,000 gallons of water per day for up to two years. The water would have come from Lake Monacan, and the ACP wanted to use it for horizontal directional drilling to bore a path for the pipeline beneath the Blue Ridge Parkway, from near the Wintergreen entrance through to Augusta County. August 6, 2018: The three-judge panel of the 4th Circuit Court of Appeals released a unanimous opinion on its May 15 Order that vacated the Fish and Wildlife Service’s biological opinion for the Atlantic Coast Pipeline. The long-awaited opinion, written by Chief Judge Roger L. Gregory, also vacated the Right-of-Way permit issued by the National Park Service for drilling under the Blue Ridge Parkway. In response, FERC issued a stop-work order for the ACP on August 10, which they lifted on September 17. August 10, 2018: FERC rejected the many petitions that had been pending before it to re-hear its October 13, 2017, decision to issue a permit for building the ACP. The action occurred on a 2-1 vote, with Commissioner LaFleur issuing a strong dissent and Commissioner Glick intentionally not participating, thus allowing challengers to bring a court suit to rehear the decision. August 21, 2018: Rather than taking any strong action on its own, the State Water Control Board adopted a motion calling for the DEQ “to aggressively enforce” the Erosion & Sediment and the Stormwater requirements for the ACP and the MVP. The Board defeated, 4-3, a motion to modify or revoke the state’s certification of a nationwide permit to oversee more than 1,000 water crossings by the MVP and ACP, but agreed unanimously to require more rigorous enforcement of state standards to protect water quality. It was later revealed that Robert Dunn, Chairman of the Virginia State Water Control Board, did not understand the ramifications of the Board’s actions on water quality certifications. September 4, 2018: Friends of Nelson and Wild Virginia submitted a motion to FERC to “rescind and place in abeyance the Certificate of Convenience and Necessity for the Atlantic Coast Pipeline issued by the Commission staff on October 13, 2017, to rescind the Final Environmental Impact Statement (“FEIS”) for the Atlantic Coast Pipeline (“ACP”) issued on July 21, 2017 in the above captioned dockets, to and to initiate a new DEIS/FEIS NEPA process in this matter.” The case will be heard in the Fourth Circuit Court in January 2019. September 24, 2018: The Fourth Circuit Court of Appeals issued a stay in the case challenging the Special Use Permit (SPU) that had been issued by the US Forest Service for the Atlantic Coast Pipeline. The case is scheduled to be argued before the Fourth Circuit on September 28. Thus the SPU allowing the project to cross national forest land is stayed pending the appeal and FERC will be asked to issue a stop work. Fall 2018: Spruce Creek Gathering – Three weekends of public education, support and communion with local and regional activists. Participants learned about the area’s unique history and geology, and how much of our economy and quality of life depends on Nelson’s natural beauty and clean water. November 8-9, 2018: On a 6-0 vote the Virginia State Air Pollution Control Board deferred until its December 10, 2018, meeting a decision on a needed air permit for the proposed compressor station in Buckingham County for the Atlantic Coast Pipeline. A major reason cited by board members for the deferred vote centered upon concerns over the disproportionate impact the compressor station would have on the minority community of Union Hill and the unsatisfactory response by the Department of Environmental Quality staff to those concerns. On November 15, Governor Northam announced he was replacing two members of the Air Pollution Control Board, the members who had raised the most questions about the air permit. Northam said it was because their terms had expired (but so had terms of over 200 citizen members of other boards who were not replaced). Further announcements said that new Board members would not be seated until after the December 10 meeting, meaning 4 Board members would vote on the permit. Organizations, media editorials, and individuals continue to criticize the governor’s actions. November 16, 2018: The ACP and Dominion filed for Quick Take in the US Western District of Virginia Federal Court in Lynchburg against at least 11 Nelson landowners. Quick Take takes away the constitutional right to due process for every defendant. It also usurps Congressional authority to make and change laws. November 20, 2018: Following requests from Appalachian Mountain Advocates (Appalmad) attorneys, the Norfolk, Huntington, and Pittsburgh districts of the Army Corps of Engineers have each suspended its authorization of the ACP. As a result, ACP lacks authorization to do any instream or wetland construction anywhere along its route. December 3, 2018: With a 3-2 vote, the Nelson County Board of Zoning Appeals denied four of Dominion’s applications for the variances to the County’s flood plain ordinance needed to construct the ACP across flood plains in Nelson. The other seven of the original eleven applications were dismissed in January 2018, and ACP will have to submit new applications for them. On December 6, 2018, ACP filed a lawsuit against the Nelson County Board of Supervisors in response to the Board of Zoning Appeal’s denial. December 19, 2018: The Air Pollution Control Board voted 3-1 on December 19, 2018, to postpone their vote on the Union Hill compressor station air permit and extend the public comment period. On December 21, the Friday before Christmas, DEQ opened a two week comment period to end January 4, 2019 – two weeks which included three state holidays and four weekend days. On December 29, DEQ announced that the Air Pollution Control Board meeting would be held January 8, 2019, and that there would be no public comment at the meeting. What a year it has been! Thank you for joining us in the journey. This entry was posted in Certificates of Approval, Citizen Activism, Compressor Stations, Court cases, Dominion, Floodplains, Friends of Nelson, News Reports, Quick Take, Support Friends of Nelson, Tree cutting, Virginia government on January 4, 2019 by Ellen Bouton. At a time when the Atlantic Coast Pipeline has had its Forest Service and National Parks permits revoked and before the air-quality permit required to build the compressor station has been issued, FERC on October 16, 2018, issued an authorization to proceed with non-mechanized tree cutting at the Union Hill compressor station site in Buckingham. The FERC letter actually says, “Atlantic and DETI have received all federal authorizations applicable for the work activities requested.” What’s wrong with this picture?! Read the FERC authorization letter here. Richmond Times-Dispatch news coverage is here. Related news: The Governor’s Advisory Council on Environmental Justice asked Northam to suspend pipeline work, but the Governor passes – see Roanoke Times news story here. The Virginia Air Pollution Control Board, which will consider the required air quality permit for the compressor station, will meet November 8-9, 2018, 9:30 am each day, at the Greater Richmond Convention Center, Exhibit Hall Building, Level 2, Room E21-AB, 301 N. 3rd Street, Richmond, Virginia 23219. A moment with the community of Union Hill, Buckingham, VA which would be destroyed by the proposed ACP compressor station. Filmed at the July Circle of Protection, “The Air We Breathe” calls out for urgent and immediate help to challenge and deny the air permit for the compressor station. We have a chance to deny the air permit for this station on November 8 & 9 in Richmond and we need your presence to support Union Hill. This entry was posted in Air Quality, Compressor Stations, Tree cutting, Videos on October 16, 2018 by Ellen Bouton. On October 3, 2018, Dominion, on behalf of the Atlantic Coast Pipeline, asked FERC for permission to proceed with tree felling in certain areas of Virginia that FERC had not already authorized. On October 5, the Southern Environmental Law Center filed a letter asking FERC to deny the request and to issue a stop-work order in light of the fact that the Fourth Circuit has issued a stay of the Forest Service permit. Because much of Dominion’s filing was “privileged” and not available to the public, SELC also urged the FERC to make publicly available the maps referenced in the ACP request showing where tree felling would occur. This entry was posted in Dominion, FERC, Tree cutting on October 6, 2018 by Ellen Bouton. “Standing Like a Tree”: @Lobo Marino makes a call to action. The emotionally powerful new video shows what the ACP could destroy. “Standing Like a Tree” was filmed at Miracle Ridge, a Virginia mountain old growth forest slated for execution by the Atlantic Coast Pipeline. Co-produced, arranged and performed by indie folk band Lobo Marino. From their Richmond, Virginia home base, Lobo Marino’s Laney Sullivan and Jameson Price have toured nationally for six years and produced seven records. Mystically political and whole heartily grassroots, this DIY band plays on large festival stages and the backyard fire pits of intentional communities across the country. Their music, built primarily around harmonium, Price’s elegantly simple full body percussion and Sullivan’s deep root vocals, carries the message of humanity’s need to find balance with nature. “Standing Like a Tree” is based on an original 1987 song and lyrics by activist Betsy Rose who gave permission to use the piece to once again raise awareness of what must be protected. The film features Ona, a 300 year old silver maple at the center of the steep slope Miracle Ridge which the pipeline would destroy, land stewards Bill and Lynn Limpert, and snapshots of the legal and direct action resistance to the Mountain Valley and Atlantic Coast fracked gas pipelines. Video was shot and edited by Chris Damon and Kate Rivara of Richmond film collective “Good Day RVA”. Additional footage by @Aspen Miller with sound captured by Patrick Ball. This entry was posted in Construction, Songs and Stories, Tree cutting, Videos on August 25, 2018 by Ellen Bouton.